Reading and share top 18 famous quotes and sayings about Screenwriting by famous authors and people. Browse top 18 famous quotes and sayings about Screenwriting by most favorite authors. 1. "I tend to jot down moments, lines, interactions that don't really make any sense. I try and explain these scattered notes to my close friends, and they become more and more logical. I see screenwriting as a bit like a math equation which I have to solve." 2. "I think if I've worked anything through with screenwriting it's that I'm not going to be able to work anything through." 3. 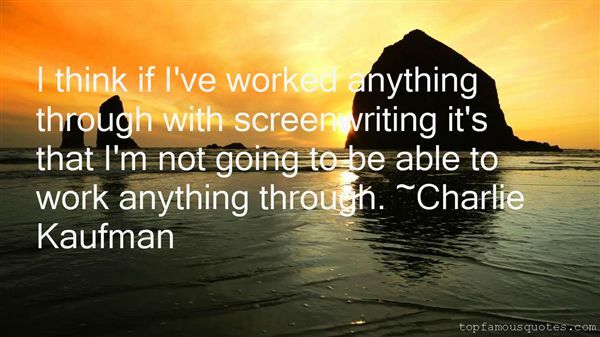 "I don't think screenwriting is therapeutic. It's actually really, really hard for me. It's not an enjoyable process." 4. "I think, in a weird way, the reason I was drawn to screenwriting and the reason I really love doing it is because I love writing dialogue." 5. "Filmmaking is a very complex form - ya know, acting, lighting, screenwriting, storytelling, music, editing - all these things have to come together." 6. "I don't mind doing scripted material. It's actually kind of a relief, because improvising is a little bit like screenwriting on your feet." 7. 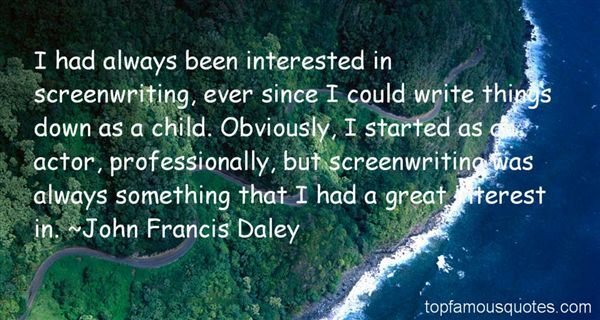 "I had always been interested in screenwriting, ever since I could write things down as a child. Obviously, I started as an actor, professionally, but screenwriting was always something that I had a great interest in." 8. "Once you see the entertainment world from both sides, you really get a greater understanding of how it all operates. As an actor going into screenwriting, I was able to understand what type of dialogue feels natural and what an actor could actually say." 9. "I find that screenwriting is at best kind of a hackwork in some ways." 10. 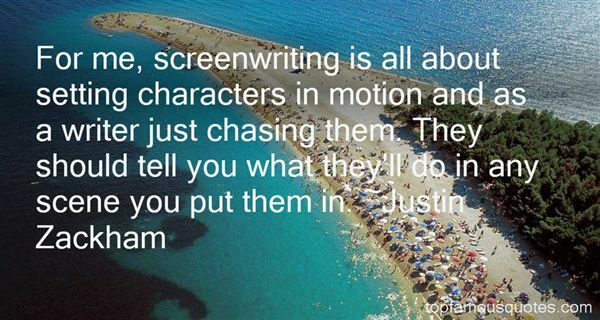 "For me, screenwriting is all about setting characters in motion and as a writer just chasing them. They should tell you what they'll do in any scene you put them in." 11. "I often attribute my screenwriting to journalism because they drill in the who, what, when, where and why - but we really need to land on that why. That's what I've been exploring in my writing for many years and trying to get better at." 12. "Working at Pixar has been like my graduate school for screenwriting." 13. "I want to get off with the screenwriting." 14. "I teach a course in screenwriting at Columbia, but I've never taken a course and I've never read a book about it!" 15. "Screenwriting is like ironing. You move forward a little bit and go back and smooth things out." 16. "All writing is discipline, but screenwriting is a drill sergeant." 17. "For me, as a writer who comes from quite a naturalistic tradition, British screenwriting is quite delicate, quite small, and rarified in a way." 18. "I'm very lucky. I actually like screenwriting. I rarely feel a sense of doom going to my desk." Oh God, my stomach must have won a medal- it's doing a lap of honour now."